Thanks Edgar, for pointing out my typo. I've corrected the error. (As a brief additional note, South Gregson actually has its southern terminus at Jackson Street, not West Chapel Hill St.) And thank you very much for the informative information about the structure of the Mutual Building - very helpful! The loss of the Ben Duke House is to me as shocking today as it was 40 years ago. It was and is a devastating blow to the beauty, historical presence and charm of Durham. I remember as a child, I could walk into its land and stroll through its garden through the unlocked and open gate. The house was not always locked and, as children, we could go into it (it was beautifully furnished) on our way to uptown as we went to see a movie on a Saturday afternoon. I remember the beautiful goldfish pond there. Often there were activities and meetings there. My brownie scouts had a special day there. There is no excuse for the demolition of such a gorgeous and important and ancient estate in Durham. I still think about it. Shame on those who decided to tear it down. It was the most elegant and beautiful place near the center of town . . . . 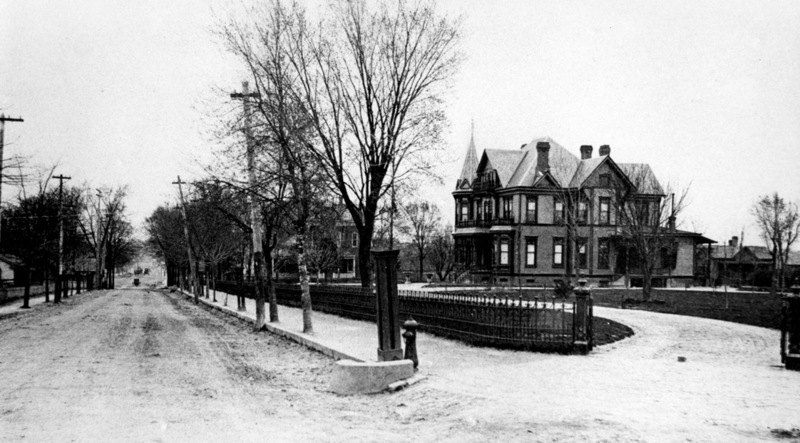 The block bounded by West Chapel Hill Street, Willard Street, Duke Street, and Jackson Street was the location of two different houses of Benjamin N. Duke, brother of James B. Duke and Brodie L. Duke, followed by a modern office tower for the Durham-based North Carolina Mutual Insurance Company. In the 1880s, Ben Duke constructed 'The Terrace' on this block - a large frame Queen Anne Victorian structure with a tower, as was popular on many contemporaneous structures. Looking east down West Chapel Hill St. ~1910. Looking east-southeast down West Chapel Hill St. ~1910. 'Four Acres' was a large, Chateauesque Revival structure designed by Charlotte architect C.C. Hook and constructed of granite and brick. It bore a strong resemblance to another structure in Durham - actually still standing - also built by C.C. Hook at approximately the same time - Greystone, built for James Stagg (who worked with BN Duke), is not as large of a structure, but is very similar in style. After B.N. Duke and his wife died in the late 1920s-1930s, the house passed to Duke University, who used the house as a guesthouse and reception area for 30 years. In 1960, the University decided to sell the property and building, and it was demolished soon thereafter for the construction of North Carolina Mutual's new office building. 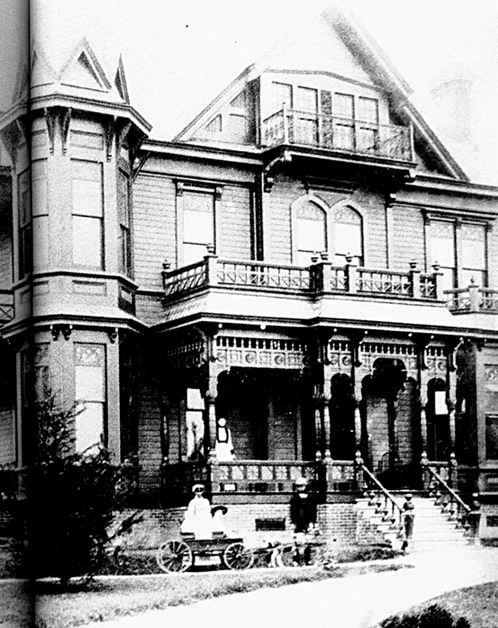 The front entrance in winter, not long before the house was torn down. The demolition of Four Acres. Interestingly, urban renewal took the outside edge of the property, including the fence. This appraisal photo from 1963 shows the property from the front of Duke Memorial Methodist looking southeast at the intersection of S. Duke and W. Chapel Hill Sts. 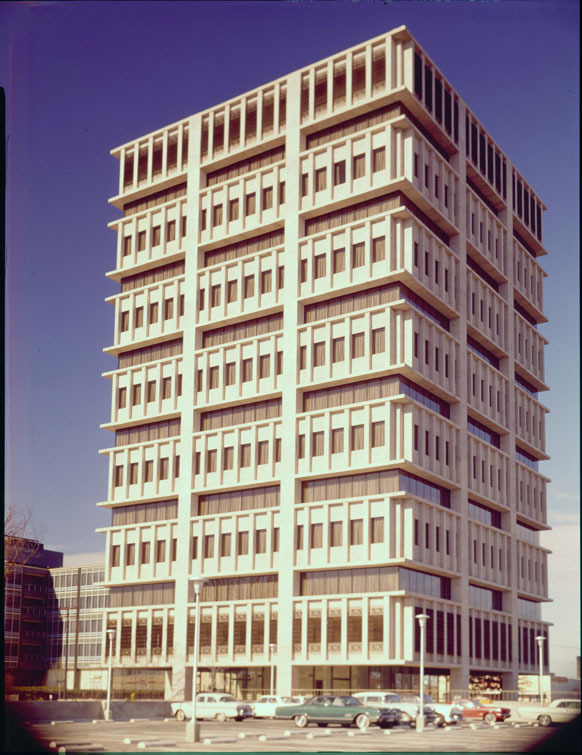 The North Carolina Mutual company began construction of their modern office building in 1964, as they had outgrown their historic headquarters on W. Parrish St. They hired architects Welton Becket Associates of Los Angeles, who had already completed multiple iconic modernist structures throughout the country - in part because of their racially-equitable hiring practices. Welton Becket worked with NC architect Marion Ham; Ham had previously worked with Edmund J. Austin in Southern Pines. N.C. Mutual building under construction, 1964 - looking northwest from Willard and Jackson Sts. The iron fence that surrounded Four Acres hasn't been taken down yet. The completed building, looking northwest from near Willard and Jackson, 1966. Looking northeast from Vickers and Yancey, late 1960s. The Washington Duke Hotel can be seen to the right. Aerial view from above West Chapel Hill St., 1960s. The building was completed to much acclaim; it was named one of Forbes' ten outstanding buildings of 1966 and one of Fortune’s top ten buildings of the decade. However, sometimes bold design is a bit too bold for the harsh nature of reality - i.e. gravity. If you look at older pictures of the building, you'll notice that there was no corner bracing in the original design. Each floor was designed to be cantilevered from the center so that the corners could be glass. It seems that Welton Becket and Mr. Ham made a boo-boo, though, and the floors sagged. The corners had to be retro-fitted with structural concrete to hold up the floors, all the way down to the unfortunate addition of corners supporting the first floor. What was a special modernist structure became fairly pedestrian after the loss of the cantilevered floors. It's not a bad structure, design-wise, but the heaviness of the concrete was previously mitigated by the fact that the floors 'floated.' Now it just looks more like a stolid lattice. The site plan is weak - creating a lot of dead space around the building that, while not overtly pedestrian-hostile, isn't exactly inviting. What I can't get past is the demolition of Four Acres in order to build it. 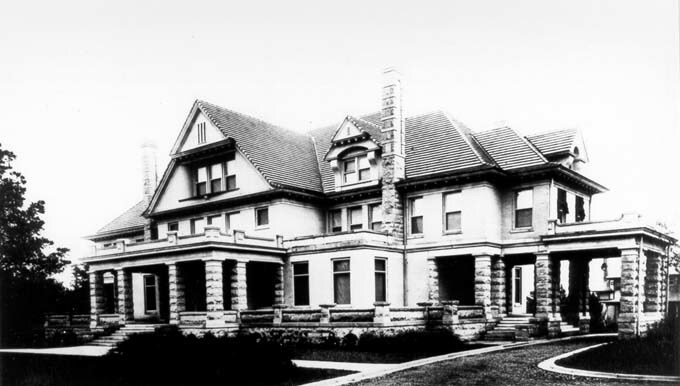 I'm not sure if the site had a certain symbolism, but the loss of the grand Ben Duke house was a deep wound for Durham - imagine if it were a Durham history museum today, or simply a tourist attraction. Thanks Edgar, for pointing out my typo.